We are a holding company which operates and regulates a fully integrated exchange offering the complete range of exchange related facilities. We are a holding company which operates and regulates a fully integrated exchange offering the complete range of exchange related facilities. These facilities include trading, clearing, settlements and depository services covering equities, derivatives, offshore listings, bonds and Islamic. 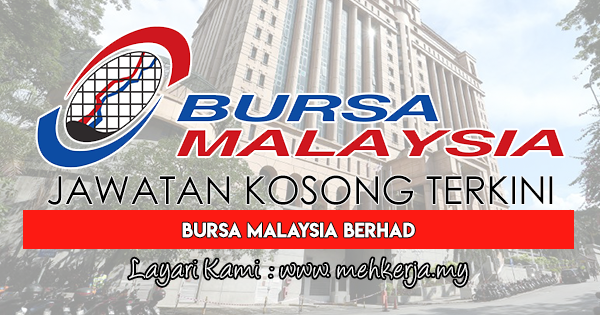 There are over 900 companies listed either on the Bursa Malaysia Securities Berhad Main Market or the ACE Market. Today, we are one of the region’s largest stock exchanges and a leader of Islamic Capital Market products and services, as well as home to the world’s most successful crude palm oil futures contract. World class infrastructure makes us easily accessible and we serve investors from over 60 nations. 0 Response to "Jawatan Kosong Terkini di Bursa Malaysia Berhad - 07 April 2018"